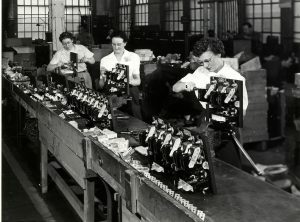 Photograph of women assembling small engines for the Allis-Chalmers Corporation. From the Milwaukee County Historical Society. 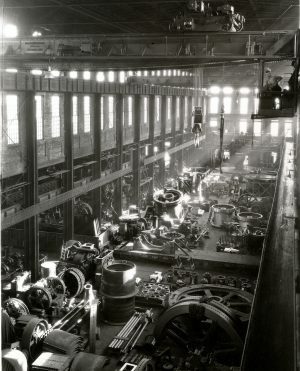 Photograph of an Allis-Chalmers work bay taken in 1930. 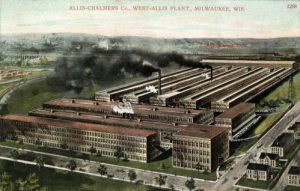 Early twentieth century postcard illustrating an aerial view of the Allis-Chalmers facilities. Greetings from Milwaukee: Selections from the Thomas and Jean Ross Bliffert Postcard Collection, Archives. University of Wisconsin-Milwaukee Libraries. 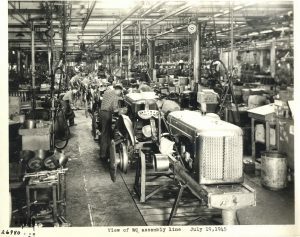 1945 photograph of Allis-Chalmers employees assembling WC model tractors in West Allis, highlighting the importance of both heavy manufacturing and agriculture in the Milwaukee area. 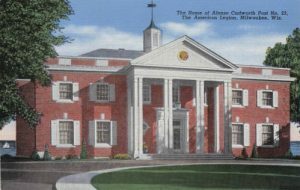 20th century postcard featuring the Alonzo Cudworth Post No. 23 of the American Legion. Alverno College Students in Washington, D.C. 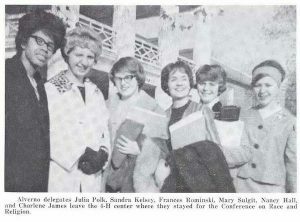 In November 1963, this group of Alverno College students attended a Student Leadership Conference on Race and Religion. Photograph courtesy of the Alverno College Archives. Reprinted with permission. Modern photograph of Alverno College, featuring the Sister Joel Read Center. Photograph courtesy of Alverno College. Reprinted with permission. 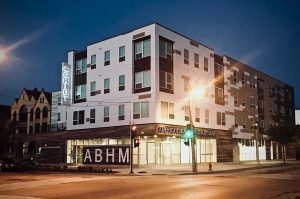 After closing its physical facility in 2008 due to financial difficulties, America's Black Holocaust Museum debuted a new building location in the Bronzeville neighborhood in 2018. From the Wikimedia Commons. Photograph by username BottlewoodMKE. CC BY-SA 4.0. 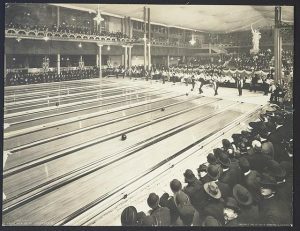 Photograph of bowlers in action at the first tournament hosted by American Bowling Congress, held in Milwaukee in 1905. From the Library of Congress Panoramic Photographs Collection. 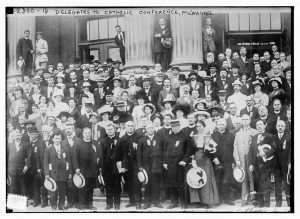 In August 1913, Milwaukee hosted a convention of the American Federation of Catholic Societies. Cardinal James Gibbons, one of the most prominent Catholic figures in the United States at the time, attended. From the Library of Congress Bain News Service Photograph Collection. Photograph featuring the Annunciation Greek Orthodox Church in Milwaukee. 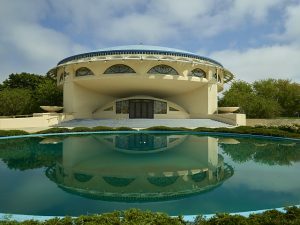 Completed in 1961, the church was designed by Frank Lloyd Wright. From the Library of Congress Carol M. Highsmith Archive. 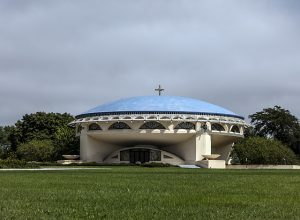 Photograph featuring the Annunciation Greek Orthodox Church in Milwaukee. The building reflects on the pool in front. 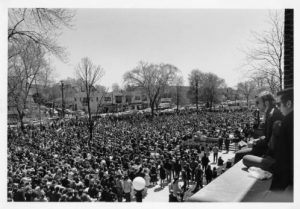 An anti-war crowd gathers at UWM in May 1970 during a month that witnessed the invasion of Cambodia by U.S. military forces and the shooting of student protestors at Kent State University by National Guard troops. From the UW-Milwaukee Photographs Collection. Archives, University of Wisconsin-Milwaukee. 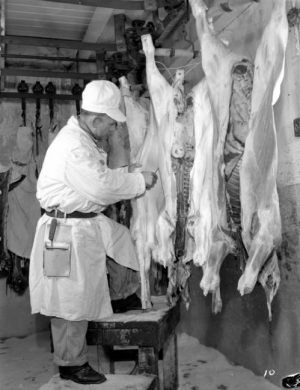 Photograph of an employee at Armour & Company, a leading meatpacking firm, skinning animals in 1943. From the James Blair Murdoch Photographs. Archives, University of Wisconsin-Milwaukee Libraries. 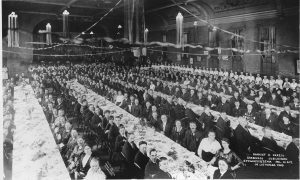 1920 photograph of attendees at the Silver Jubilee Banquet of the Association of Poles in America Banquet. From the Roman B. Kwaniewski Photographs Collection, Archives. University of Wisconsin-Milwaukee Libraries. Photograph of the Badura Family Tavern built in 1912. 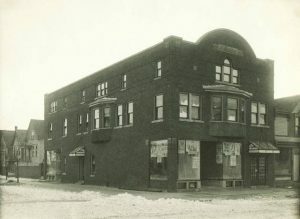 Located on Lincoln Avenue, the tavern also had a popular bowling alley in the basement. 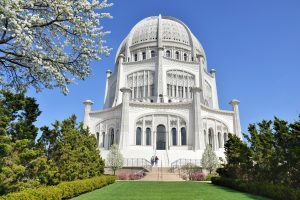 The Baha'i House of Worship located in a suburb outside Chicago is the only Baha'i temple in the United States. Wisconsinites donated to the temple's construction, which took over forty years to complete. From Flickr. Photograph by username jpellgen. CC BY-NC-ND 2.0. 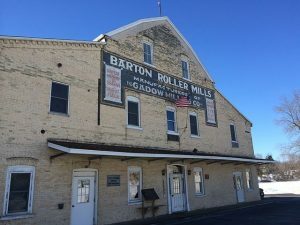 Milling activity, such as that which took place in the Barton Roller Mills, was a foundational business enterprise in Barton. From the Wikimedia Commons. Photograph by Jon Roanhaus. CC BY-SA 3.0. 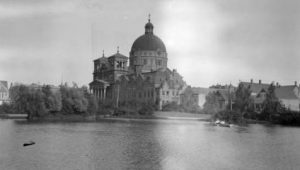 Photograph of the Basilica of St. Josaphat over the lagoon in Kosciuszko Park. From the Roman B. Kwasniewski Photographs Collection, Archives. 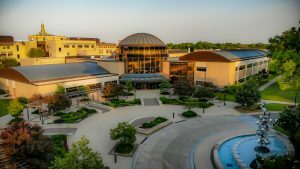 University of Wisconsin-Milwaukee Libraries. 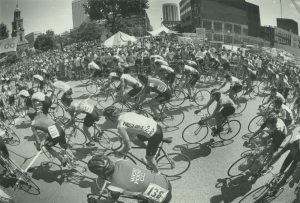 A large crowd watches as people participate in the Bastille Days bike race in 1983. From the Historic Photo Collection of the Milwaukee Public Library.